Afro-Guyanese, largely supporters of the David Granger-led administration, were Sunday urged to pressure government into looking after their welfare in exchange for the votes that they cast for the APNU+AFC coalition last year. The calls were issued at the Cuffy250 Fourth Annual State of the African Guyanese Forum held at the Critchlow Labour College, Woolford Avenue, Georgetown. Delivering the opening remarks at the plenary session on “Socio-economic and Political Self-Realisation,” was Executive Member of Cuffy250, Professor David Hinds. “We have a government that we voted for and if you vote for a government, you got a duty to direct that government,” he said. Hinds noted that President David Granger in his address to the opening session called for a plan to improve the condition of African Guyanese. “We have to take him at his word” after crying out in the wilderness for 23 years, a clear reference to the People’s Progressive Party Civic’s (PPPC) period of rule from 1992 to 2015. The Cuffy250 official said Afro-Guyanese would only secure benefits if they push and advocate to ensure that the government does something tangibly rather than only around election time. 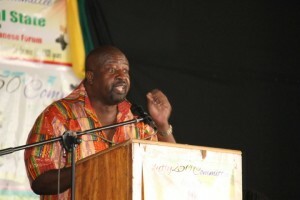 He called on Afro-Guyanese to collectively place a high premium on their votes cast at the May 11, 2015 general elections. “If the Africa Guyanese community rise up and says our votes meant something, our votes are worth something, our votes have value and so we have got to get value for our votes and we want that value in policy- policy that helps our community directly and indirectly,” he said. A similar call was made by General Secretary of the Guyana Trades Union Congress (GTUC), Lincoln Lewis who stressed the need to hold the government accountable. “We vote for them and they must deliver for us. Don’t run away from it. Don’t tell me is we government and we shouldn’t talk about them,” he said and questioned whether the APNU+AFC administration was preparing for its supporters to turn against it at the 2020 general elections. Hinds and Lewis said it was not about just criticising the government but it was about keeping them in check so that the APNU+AFC could continue to run the country. Lewis said it was time to end the talk about social cohesion and instead dole out funding, some of which could be diverted from the GYD$16 billion GuySuco bail-out, to revive village economies. “I am arguing that it will take a heavy dose of government intervention to ensure that African Guyanese have equality of opportunity,” he said. Those, he said, must include an investment in villages such as a Caribbean Development Bank (CDB)-funded project in four Afro-Guyanese villages. Hinds said agriculture must be merged with business so that Afro-Guyanese could develop their own businesses such as value-added entities to export products to sister Caribbean Community (Caricom) member states. The Cuffy250 official also recommended that steps be taken to address past discrimination in the award of contracts through the procurement system. “I am calling on the government to institute affirmative action in the granting of contracts, that there must be set aside money and set aside contracts for small and medium-sized contractors and we know that most of contractors in the Afro-Guyanese community are small and medium-sized. Give them a share; the government must ensure that,” he said. He recommended that several contractors come together and bid for large contracts. “We have to learn to be communal again so, therefore, the cooperative spirit has to return to our sense of community and our sense of business,” he said. Among the policies, he said, that affected Afro Guyanese was the retrenchment of thousands of workers as part of an International Monetary Fund (IMF) Structural Adjustment Programme but there was no Black private sector to absorb them. “Policy has ethnic impact and sometimes we don’t talk about and so, therefore, when you make those decisions and they have a negative impact it means, therefore, that when you are beginning to correct them you have to take into consideration the ethnic situation,” he said. While the private sector is widely touted as the engine of growth, Professor Hinds reasoned that the then People’s Progressive Party Civic (PPPC)-led administration empowered its supporters in the private sector. “I don’t see anything fundamentally wrong with that except that what they needed to do was to make sure that the people who were not its supporters were also empowered and that is what I take issue with,” he said. He said the agro-based village economies eventually collapsed because colonial and post-colonial governments stopped investing in agriculture, and improving drainage and irrigation, rangers against predial larceny and the Guyana Marketing Corporation declined. “If you do not invest in repairing agriculture and bringing it into the modern world then…it is not going to beneficial, it is not going to be financially feasible to continue to farm anymore,” he said. There are no banks that are friendly to African Guyanese that you can go to and get start-up loans, cooperatives and vendors who imported food during the 1970s and 1980s when there were massive food shortages during bans and restrictions.